April 1919, the remnants of the Battalion, (the cadre) moved from Cologne (Germany) to Wagnies-le-petit, near Valenciennes (France) as part of 50th Division. Note: Everard Wyrall's "History of the 50th Division 1914-1919" does not mention this as the narrative finished with 11th November 1918. Commanding the Battalion was Lt. Col. H.W. Weldon, D.S.O., the battalion was reformed from regular soldiers with less than two years service still to serve; those who had volunteered for the Army of Occupation but whose service would expire on the 1st January 1920 and those eligible doe demob. The battalion strength numbered 48 officers and 452 other ranks. 26 June 1919 the battalion moved to Fort Purbrook, Cosham. 14 July 1919, the battalion provided a 'colour party' at the Victory Parade in Paris. The following formed the colour party. 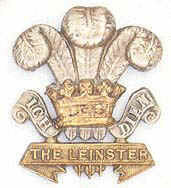 Lt. D. P. A. McCann, M.M., CSM J. McCarthy, D.C.M., L/Cpl G. Regan, D.C.M. 19 July 1919, the battalion provided the same 'colour party' at the Victory Parade in London. One officer and 20 other ranks, who had all originally landed with the Expeditionary Force in France in 1914, were also contributed by the battalion to this parade. 4 November 1919 the battalion moved to Sobraon Barracks, Colchester as part of Eastern Command. 6 February 1920 H.R.H. The Prince of Wales presented to those on parade, at Colchester, the medals and decorations won during WW1. 31 May 1920 the battalion moves out of Colchester for active service in Silesia, a province in the south-eastern area of Germany adjoining Poland. Note: One hundred new recruits together with training staff remained at Colchester. 5 June 1920 the battalion arrived in the small village of Grudschuttz and assigned to the 2nd Brigade along with 2Bn Black Watch and 1st Bn Durham Light Infantry Note: The 1 Bn Royal Irish Regiment & 2 Bn Connaught Rangers along with 3rd Bn Middlesex formed the 1st Brigade. 8 June 1920, the battalion takes up position in Rosenberg. 5 July 1920 the Battalion moved to Koschentin and the companies were distributed amongst local villages as follows. "A" in Lissau, "B" in Woischnik, "C" in Kaminitz and "D" in Boronow. 23 August 1920 the battalion returned to Rosenberg. 4 December 1920 the battalion moved to Oppeln. 25 March 1922 the battalion embarked from Oppeln for Dover via Cologne and Ostend then returning to Sobraon Barracks in Colchester arriving on the 29 March 1922, to remain there until disbanded.